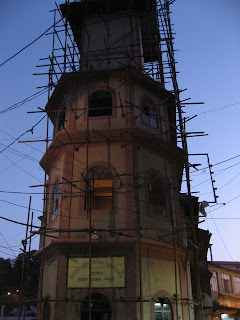 It was Wednesday night and time for us to head into the bazaar for our dinner. We usually have soup and cheese sandwiches at home, but like to head out occasionally, too. I think I mentioned before that we are glad to have a motor scooter available. It is a long walk into the bazaar from Oakville, more than I am willing to do in the evening. 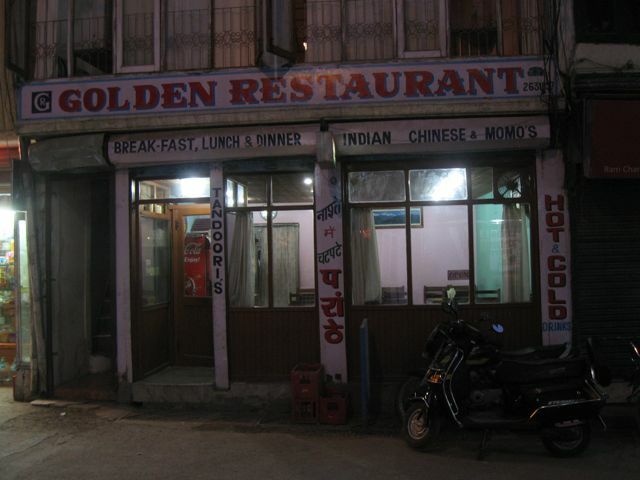 This time we ate at Golden Restaurant, right by the Clock Tower in Landour. The Clock Tower is being renovated and is surrounded by scaffolding. While we were eating, men were carrying in sections of corrugated metal, about 3x8 feet. I’m not sure if they were for the roof or for something else inside. Ram Chander’s general store has moved across the street from its long-time location. It has been renovated and is clean and bright. 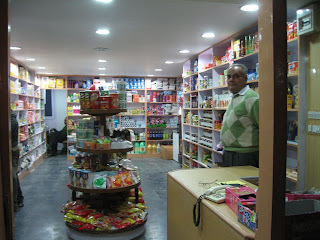 The manager told us the old location will soon be the Nainital Bank. Golden is a decent Indian restaurant. 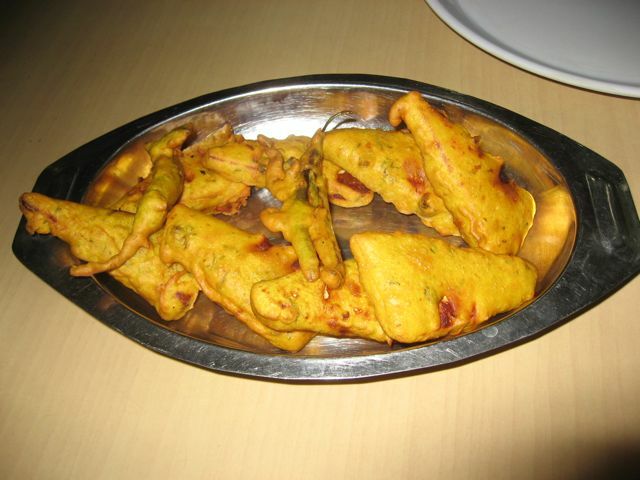 We started with paneer pakoras (a favorite appetizer). 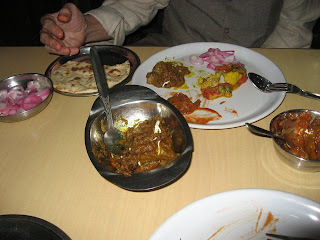 Dan had Dry Mutton Curry, a specialty he remembers fondly from the old Kwality Restaurant in Dehra Dun. This was nearly as good. We also had Gobhi Mutter (cauliflower and peas) and tandoori roti. Very delicious! Thank so much for the pictures and mentioning foods! And the shot of King Dan upon his scooter . 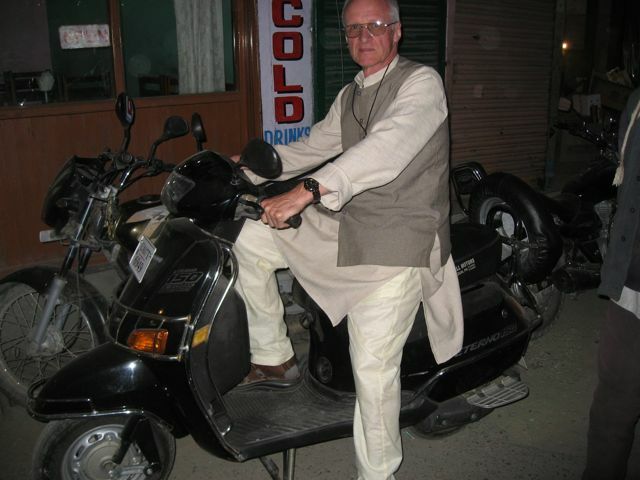 . . recalling his years of biking/motorcycling and even taking you to the hospital on a two-wheeler. Enjoying your adventures there, again!